Butter is an essential ingredient in baking. Whether you’re a holiday baker or a baking fanatic, you’ve probably encountered the disappointment of raggedy-edged cookies or puff pastries that have the delicacy of hockey pucks. If your baked goods never, ever come out looking like the pictures in the cookbook, the culprit is (you guessed it) butter. Butter is so ubiquitous that it’s easy to take the creamy substance for granted, and remain unaware that, as a baking ingredient, butter is quite finicky. Think about it. Creaming butter in a mixer (or spreading it on bread, for that matter) is a snap when the butter is 65 degrees. Kick it up just a few degrees, though, and you’ll have a pool of melted butter that will run afoul of your best intentions. But temperature is just one factor to consider when baking with butter. Because butter works in concert with other ingredients (like sugar, eggs, and flour) to give baked treats body and texture, it’s important to fluff up butter with air. That’s why the first step of most cookie recipes is to use a mixer to cream the butter. As the beaters whip the butter, they’re adding air pockets. Sugar adds more air pockets, and leavening agents like baking soda and baking powder expand those pockets, providing baked goods with their signature texture. In a professional kitchen, ingredients like flour and butter are weighed. In most recipes, professional chefs use unsalted butter. If you’re an avid baker, have you ever wondered why some recipes call for butter and others for unsalted butter? Even more perplexing is why some recipes call for both unsalted butter and salt. Professional pastry chefs always use unsalted butter, but are they being persnickety or does their preference have a scientific foundation? The answer is a little of both. 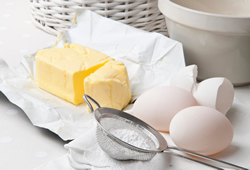 The salt content of regular butter varies by manufacturer, so using unsalted butter is a means of controlling how much salt is in baked goods. The rule of thumb is that, if you’re going to substitute salted butter for unsalted butter, reduce the amount of salt in the recipe by 1/4 teaspoon per 1/2 cup of butter. In addition, salted butter typically contains annatto, a coloring agent that gives butter its signature yellow color. That accounts for the persnickety preference. However, it also turns out that salted butter has a higher water content than unsalted butter. Because unsalted butter has less liquid than salted butter, it’s more likely to form a stable structure of air pockets when creamed. The other characteristic to note is that unsalted butter has a shorter shelf life than salted butter. 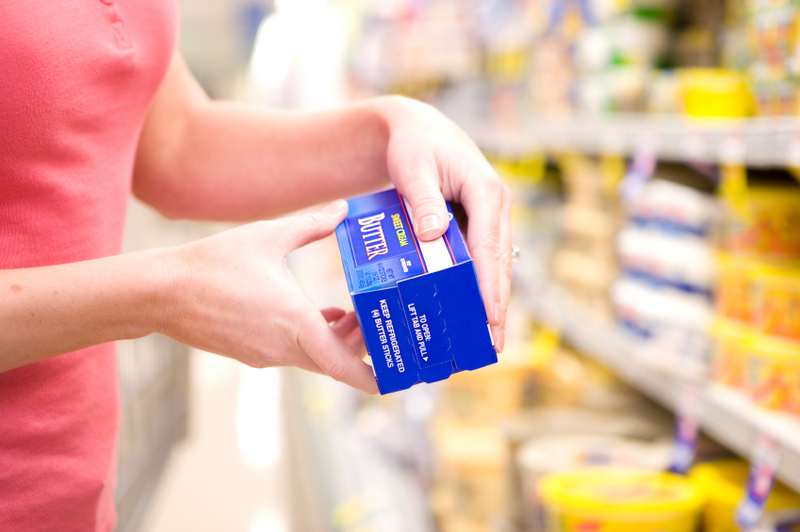 As a quick glance in your grocery storeâ€™s dairy case will confirm, there are many different types of butter. 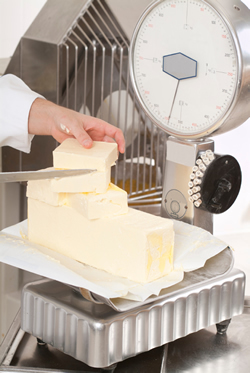 American butter typically has a fat content of 80%, while French butters are required to have an 82% fat content. 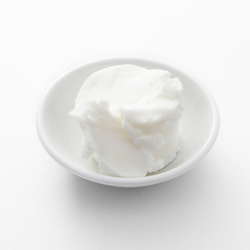 Some European-style butters can have as much as 85% fat. French pastry chefs often use beurre cuisinier, beurre patissier, or beer concentre, specialty butters that are almost pure butterfat and that are manufactured to melt at specific temperature ranges. While butters can have distinct flavors (due to factors like the dairy cows’ diet, whether or not fermentation is allowed to occur, and chemical properties that are influenced by the manufacturing process), most of these subtle flavor differences disappear in the baking process. What doesn’t vanish is the effect of the butterfat on the baked goods. The higher the butterfat content, the flakier the pastry. Shortening is made purely from hydrogenated fat. It is 100% fat. Why, then, do some recipes call for butter, others for shortening, and some for both? In short, butter doesn’t contain hydrogenated fat, while shortening does. Shortening doesn’t contain water, while butter does. Thus, shortening is more stable at warmer temperatures (due to the hydrogenated fat), and it causes the gluten in flour to expand less (due to the absence of water), making the finished product more tender. In other words, shortening remains solid and malleable in temperature range that’s triple that of butter. When baking, the question you must ask yourself is whether you’re willing to sacrifice the flavor of butter for the ease of shortening. Help grow this exhibit! Join in the fun by sending your favorite tips for baking with butter, or your tried-and-true recipes. Read more about sharing your tips and recipes.